For immediate release 5 November 2012: A cross-party inquiry into how to get Britain cycling was launched by Conservative, Labour and Liberal Democrat MPs in Westminster today. The Inquiry – which is backed by the UK Cycling Alliance (UKCA), an umbrella group for cycling organisations – will seek the views and experiences of organisations and individuals on how the government can help get more people cycling by making it safer and easier. 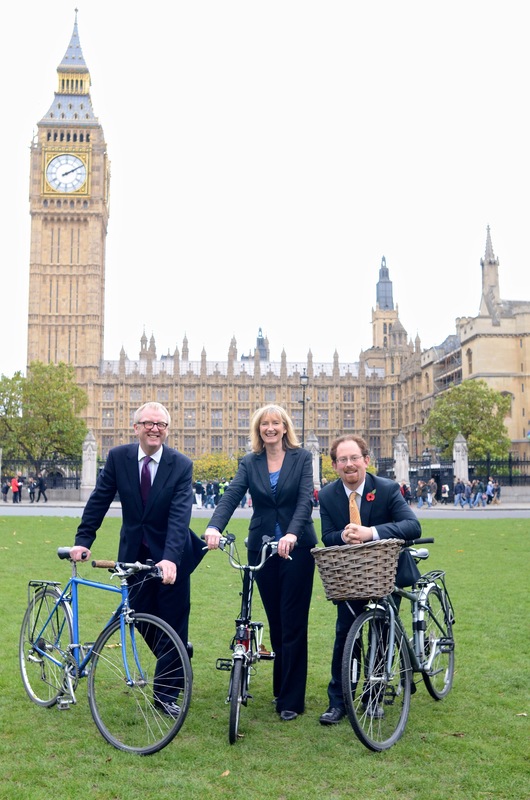 Chairs of the All Party Group on Cycling (APPCG), Ian Austin MP and Julian Huppert MP were joined by fellow the Group’s Treasurer Dr Sarah Wollaston on Parliament Square – see attached photograph. As well as written evidence, selected contributors will be asked to talk with members of the Group in person at six evidence sessions in January. The Inquiry will look into the full range of issues affecting cycling in the UK, including road safety, urban design and how public transport and cycling can work together better. The title – ‘Get Britain Cycling’ – reflects the Group’s aims of helping to find ways to help everyone use a bike more often, from long-term, long-distance enthusiasts to those who have never ridden before being able to cycle as part of their daily routine. The deadline set for written evidence is Wednesday 5th December. The evidence sessions will take place between 9.30am and 11am respectively on the 13th, 20th, 27th of January and 6th, 13th and 27th February in Committee Room 13 of the House of Commons. Expenses for the Inquiry, including the employment the report’s author, are being met by a donation by News International. The All Party Parliamentary Group on Cycling aims to promote the use of bicycles as a mode of transport and to raise both inside and outside the House the practice and status of cycling. The UKCA aims to ensure that any new regulation or legislation takes into consideration the best interests of cyclists, and other vulnerable road users. It is a non-party-political alliance, working closely with the All Party Parliamentary Cycling Group. The UKCA funds Adam Coffman, who is located at the Palace of Westminster, and liaises with the APPCG. The participants in the UKCA are the Association of Cycle Traders, Bicycle Association, British Cycling, CTC, Cycle Nation, London Cycling Campaign and Sustrans.